A grand staircase descends from the historic Post Office building into the modern Bram Goldsmith Theater. Clad in copper-tone materials, the 500-seat jewel-box venue beautifully complements the architecture of the historic post office. 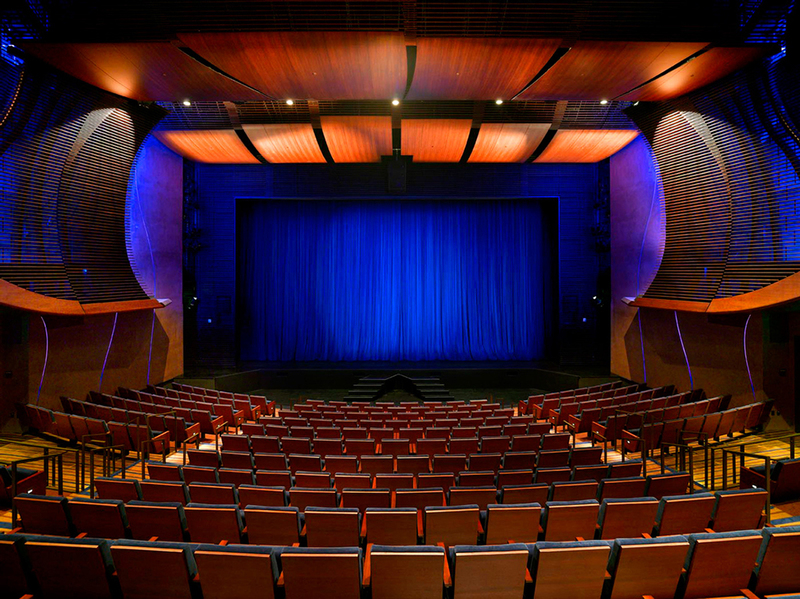 With a state-of-the-art stage and sculptural wood interior, the theater’s intimate setting ensures that every patron is not far from the performers with spacious seating, adaptable acoustics, cutting edge lighting and excellent sightlines. The Goldsmith is well suited for musicals, dramatic theater, dance, music – classical and popular, chamber opera, professional children’s theater, lectures, meetings and more. A special acoustically isolated “quiet room” has been designed at the rear of the theater to accommodate people with special needs. The grounds will also have production facilities and administrative offices. The Bram Goldsmith Theater’s state-of-the-art accommodations will ensure that guests experience the finest setting for world-class theater, music, and dance. The goal for the acousticians is to create of a sonically intimate and visceral chamber for both artists and audiences. To start, The Goldsmith was designed with massive, solid concrete walls and roof to isolate the traffic noise from Santa Monica Boulevard. The interior walls are lined with panels of wood pieces whose size, shape and spacing has been calculated for the best possible balance for music: some are sound reflectors that add clarity and spaciousness, and some are sound transparent, allowing sound to travel through to the top rows of seating, to create a warm reverberation and extended resonance. The hall was built with flexible acoustics for classical and acoustic performances, theater and amplified popular music. For classical and acoustic performances, there is a tunable wood orchestra shell; for amplified and spoken word events, there are adjustable acoustic drapes on the walls and ceiling hidden behind the wood walls. These settings will be determined by calculations as well as “tuning “ during the sound check with the live musicians on stage. The wood panels, orchestra shell and acoustic drapes all work together to form a holistically integrated whole. Finally, the air systems are designed to be dead quiet so that music and spoken word are not competing with air-conditioning, heating, and other mechanical vibrations. The Goldsmith is also the first performance center on the West Coast to incorporate an Induction Coil Sound System, an amplified audio “loop” system that interacts with telecoil hearing aids to provide optimized sound for the hearing impaired. The source of sound, microphone or audio, is transferred to a loop amplifier while simultaneous loops of cables under the floor produce a magnetic field. With sound being fed directly into the telecoil hearing aid, (80% of all hearing aids), the listener is free from static and background noise. The hearing loop user no longer needs to borrow, wear or return special equipment. Those without telecoil hearing aid can plug earbuds or headphones into the venue’s available receivers. The Goldsmith also features a soundproof room that provides a calm space for families or those needing privacy during performances. The high quality state-of-the-art sound system in the main house is fed into the surround-sound speakers of the special room; the glass that makes up the windows in the Quiet Room is angled to prevent glaring, and the middle panel provides stunning clarity with projection quality Starfire Glass. 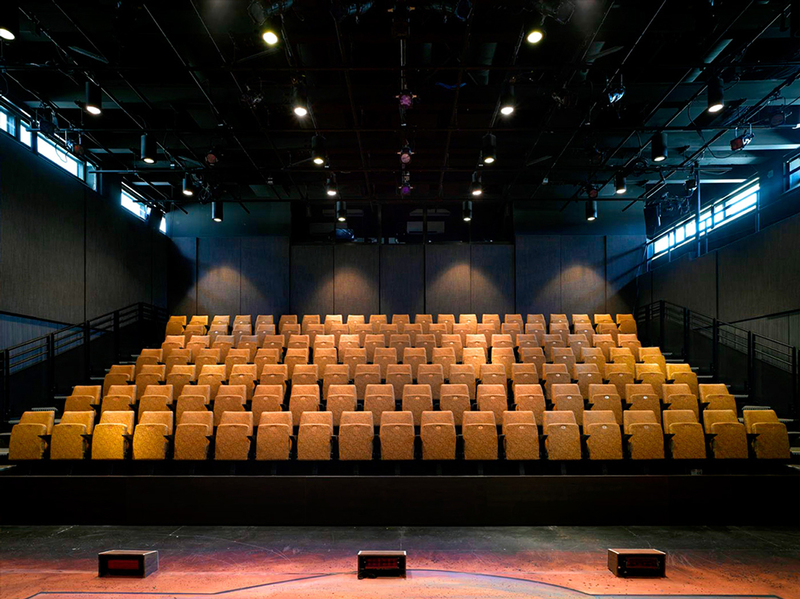 The 150-seat Lovelace Studio Theater provides a flexible performance stage for public performances, children’s programming and is the heart of the theater school for young people. The space is specially designed with stadium seating that can retract to bring the size of the room to 4,000 square feet of performance space. It perfectly suits new work, small productions, black box, cabaret, workshops, student performances, rehearsals and special events. Adjoining the Studio Theater are three new classrooms that hold up to 20 students each, allowing youth to express themselves creatively through the arts.